If you’ve been following me for a while you know I have just one rule I abide by when I assemble these lists: only beers I reviewed for the first time in the calendar year are eligible (so re-reviews are ineligible). 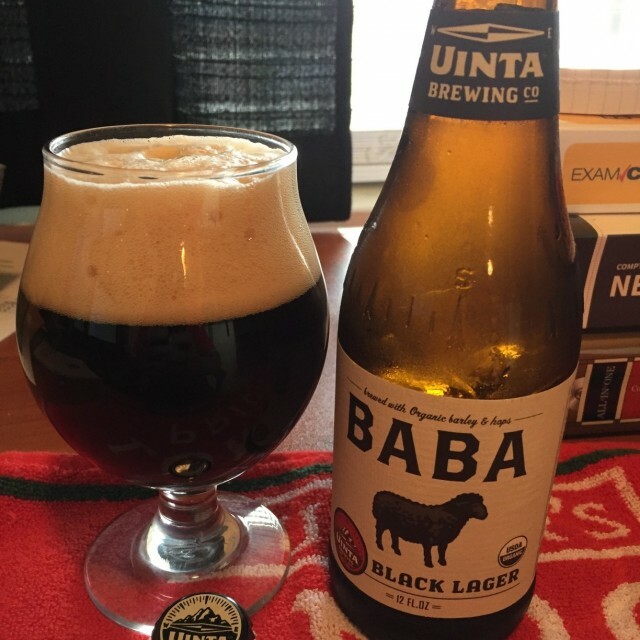 Additionally, it doesn’t matter if the beer has been around for years or is a new product, just that I reviewed it for the first time in that calendar year. This inevitably leads to some people being shocked that I had never reviewed certain world renowned brews until recently. Hey, there are a lot of beers out there, and after doing Chad’z Beer Reviews for nine years, I still haven’t gotten to all of the most readily available stuff (world renowned or otherwise). 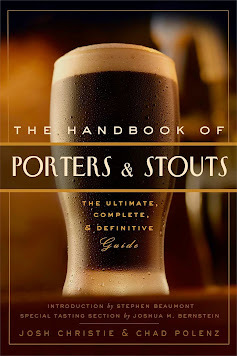 This year I started grading beer to BJCP style guidelines rather than to personal preference as I have in the past. However, I’m not listing the ten highest-scoring beers I reviewed regardless of style, but rather the ten I personally enjoyed and found the most memorable this year. In fact, there were plenty of eligible entries which received higher scores than some on this list, but I left them off because they weren’t as impressive. Another stipulation I adhered to this year: only one entry per style and brewery. You’ll notice that there’s only one IPA, one imperial stout, four lagers, and four non-American beers on this list! In fact, this list has the most variety of any “top ten best beers of the year” list I’ve ever assembled. Well, here’s something I thought I’d never see: a light lager on a “Best Of” list. Admittedly I am playing hometown favorites here. 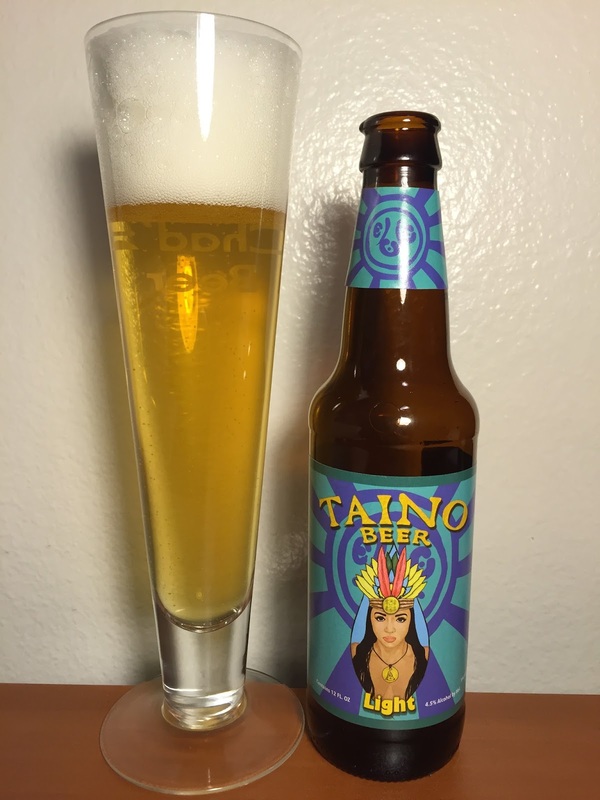 Boricua is a new Puerto Rican-owned brand contract brewed by Florida Beer Company. I bought this thinking it was going to be a lame, bland lager but it turned out to be remarkably flavorful for a “light” beer at 4.5% ABV. It has some authentic pale/amber grain flavor. There’s a subtle spicy hop in the background with mild bitterness. The drinkability is high, too. It’s light-bodied and crisp, but not paper thin. Refreshing while in the mouth with no aftertaste. This beer is probably brewed to a specialty lager style (e.g. Helles, Kellerbier, etc. ), but since it’s marketed as a light lager I scored it to category 1A (American Light Lager) specs and it met the guidelines extremely well. The only thing that would make it better would be if it were in cans instead of bottles since it’s an ideal beach beer (especially here in Florida where it’s sold). I’m not usually a fan of black lagers (a.k.a. Schwarzbier), but this one really surprised me. Malt-forward with dark malt and some roastiness and coffee in the background. Dry bitterness at the apex with slight floral/pine hops. Sweet, but far from cloying. Not wonderfully delicious, but absolutely to-spec on all points! It also looked great, smelled great and was easy and fun to drink at only 4% ABV. What’s even more impressive is that I was drinking a fairly old bottle at the time. I’d imagine a fresh serving would be a classic example of the style. I saw this bottle at the Beer Bloggers Conference and it made me chuckle. I wasn’t expecting much, but once I sat down to review it I realized it was a fantastic, to-spec Munich Dunkel (which is similar to Schwarzbier but not exactly the same). 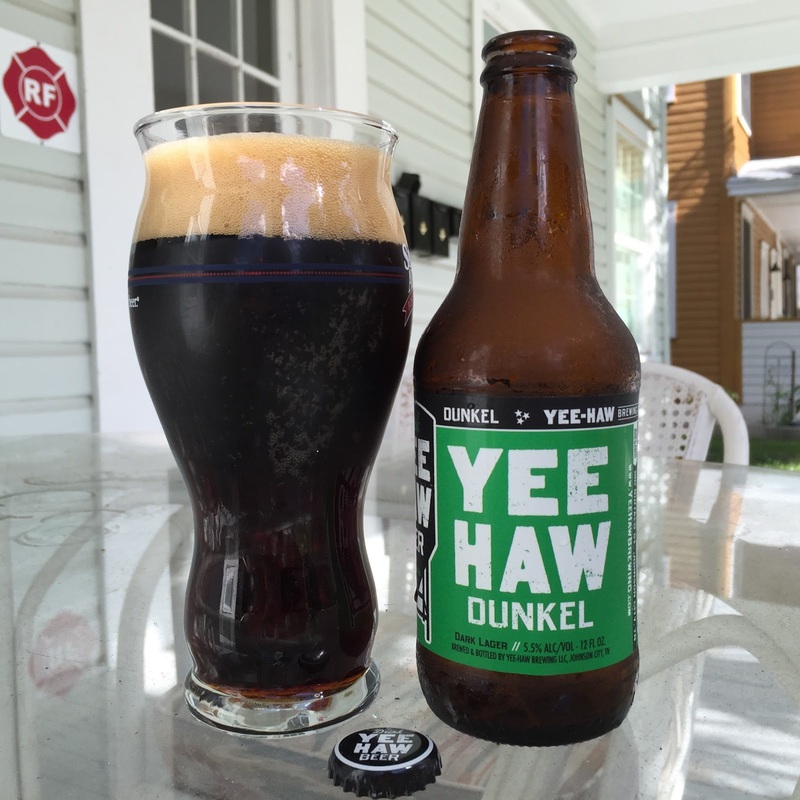 Yee Haw Dunkel is surprisingly sweet with dark toasted malt (not burnt or deeply roasted). There’s a slight nutty character in the background. Finishes with strong toffee/chocolate flavors. Mild spicy hop bitterness for balance. Delicious. I could session this all day, but since it’s 5.5% ABV (and not sold where I live), I won’t. This beer is impressive considering so few American breweries make this style. Probably the best of the style I’ve had. We Americans tend to love big beer styles like Double IPA, Imperial Stout and Barleywine to name a few. One style that is overlooked and underrated is Doppelbock – a niche German lager style that’s as big and bold as the huge ales. 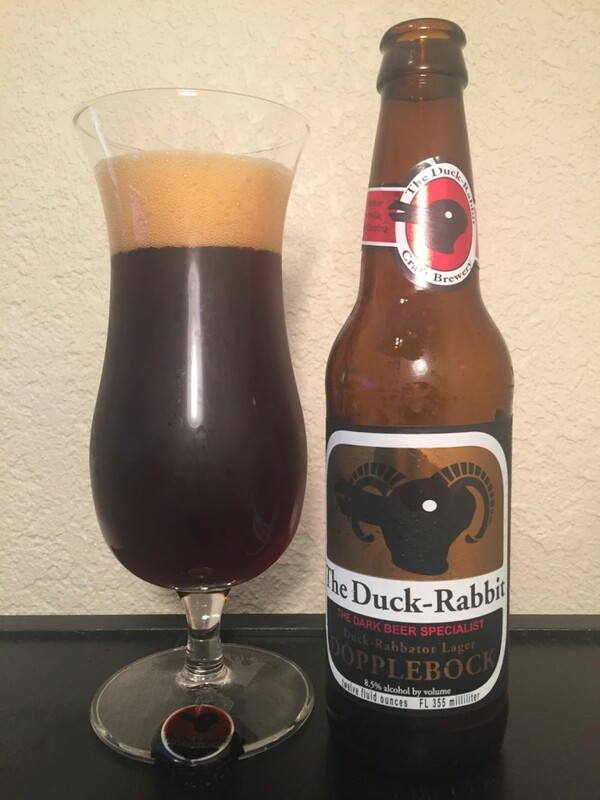 Duck-Rabbator Dopplebock [sic] is probably one of the best American examples (if not global examples). Huge malty sweetness (but not cloying) with delectable dark fruit flavors throughout. Some confectionery flavors of caramel and milk chocolate can be found in the background. Mild spicy hop bitterness is perceived on the finish as is alcohol. Clean lager character. Full bodied with a thick, soft texture (but never syrupy). Alcohol warmth is pleasant and gentle. Remarkably clean aftertaste is a nice bonus, too. I’d imagine this would age well at 8.5% ABV, though a fresh vintage in the spring might be fun to try as well. I love wheat beers, especially authentic German hefeweizens. However, its bigger brother – the weizenbock – is often just as good, but much less popular. 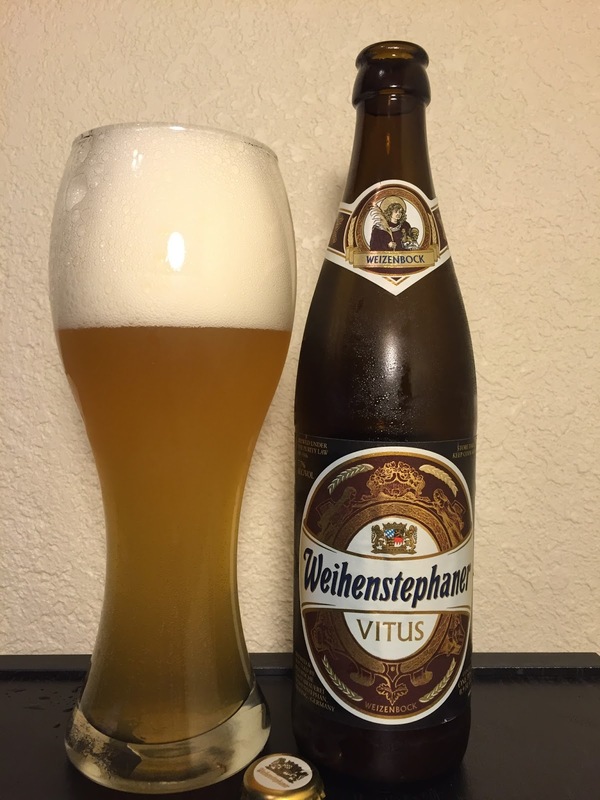 Weihenstephaner Vitus was just what I needed in the early Florida summer: a bready/grainy base with yeast esters that impart sweet banana and bubblegum flavors. Lemon and clove are also present in the taste and in the aroma. You’d never know it was a strong 7.7% ABV since the body is medium and it’s highly effervescent and refreshing. This beer is widely distributed and easy to find, yet it’s a sleeper. If you’ve never tried it, pick up a bottle and you’ll be glad that you did. 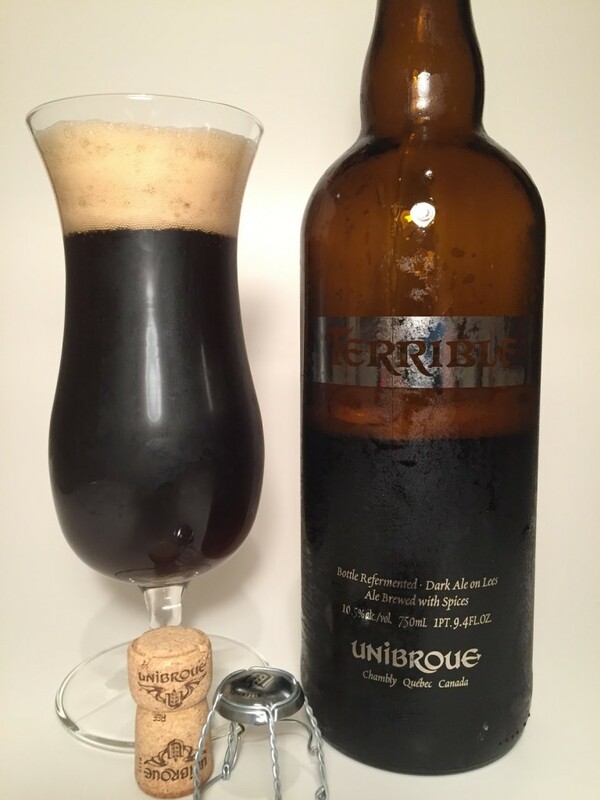 Naming your beer “the terrible” is, in my opinion, a terrible idea. However, if you’re familiar with the Quebec-based Unibroue brewery you know they make outstanding Belgian-style beers which are always on-point. Perhaps the name of this beer is sarcasm or reverse psychology because it should ideally be named “La Fantastique” since it’s a world class example of the Belgian Strong Dark Ale style. Robust and complex palette. Spicy black pepper sensation up front. Rich sweet dark malt presence with bread and fruitcake flavors throughout. Dried and stone fruit flavor preside from beginning to end. Faint orangepeel in the background. The 10.5% alcohol imparts a lightly sweet vanilla-like taste. Perceived bitterness is medium-low as is hop flavor (spicy/earthy). Aftertaste is akin to Coca-Cola. I can’t believe I waited until 2016 to finally try this. Here’s another classic Belgian brew I had somehow never gotten around to reviewing until this year. 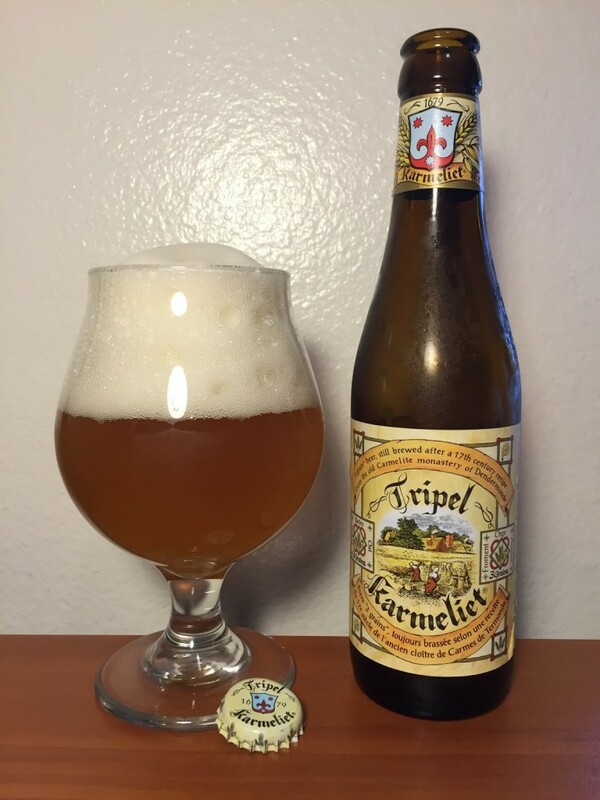 I don’t know what I was waiting for since the Belgian Tripel style is one of my personal favorites and now that I’ve had Tripel Karmeliet, I’d say it may be the second best Tripel I’ve had (right behind Unibroue’s “La Fin Du Mounde”). The palette is a delicious combination of fruity flavor, sweetness, and spiciness from the Belgian yeast esters. Peppercorn and alcohol show up first followed by sweet blonde/pale malt. Lemonpeel, banana, melon and green pear on second half. Spicy sensation on finish. Medium/full body. Highly effervescent. Dry finish. Some alcohol warmth complements palette. Refreshing and crisp. Classic example in every facet. Delectable and enjoyable drinking experience. Sours seem to be all the rage these days, but I’ve honestly never been a huge fan of them because they all seem to taste the same. So for a sour to show up on this list (and at #3 at that), you know I must’ve thought it was great. 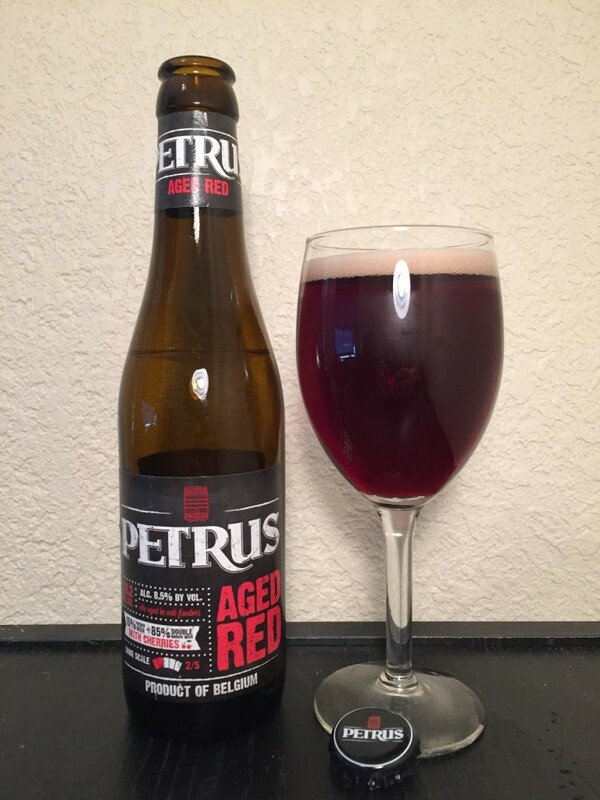 Indeed, Petrus Aged Red is one of the better sours I’ve had and that includes Cantillon and Russian River. Maybe I’m a little biased for this because the Petrus reps were at the Beer Bloggers Conference and gave a thorough presentation on how their beers are made and the science that goes into finding the perfect blend of new and old beer as well as adding the right fruit for that delicious tart/sour cherry taste. I recommend picking up one of their “Sour Power” mix packs which are available at most good beer stores. C’mon, you knew there had to be an IPA on this list (I am an American beer blogger, after all). In 2016 I reviewed 47 IPAs, nearly half of which scored at least 40/50. It was difficult to decide which one specifically to include on this list. 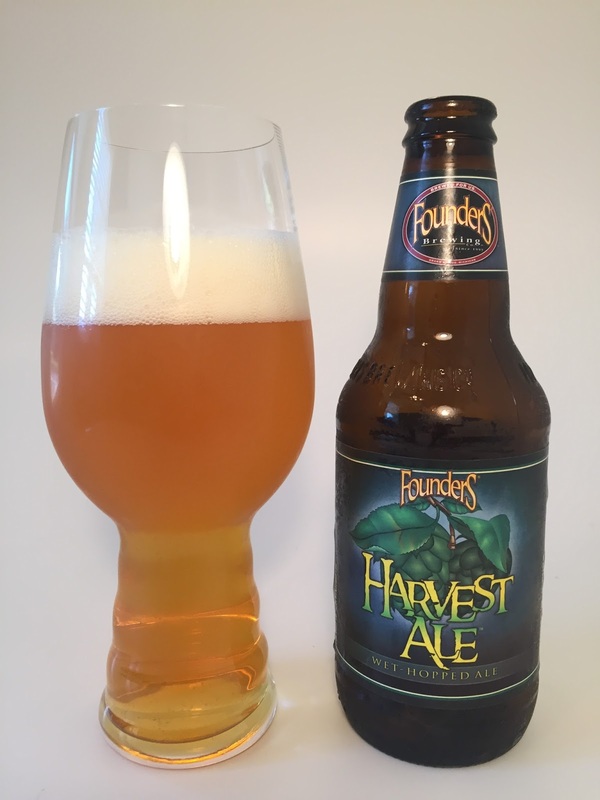 I opted for Founders Harvest Ale for a few reasons. First of all, of all the IPAs I reviewed it’s the one that immediately came to mind when I was making this list. Secondly, it’s an impressive brew because it uses wet hops and it’s mass-produced. You should be able to get this beer anywhere. I’m kind of over hyped-up IPAs that you have to wait in line for hours to buy. Why can’t an off-the-shelf IPA be just as good or better? Well, to me, this is such a beer. Huge citrus/tropical fruits (akin to a juice concentrate). Grassy/herbal aroma is quite prominent as well. High American hop flavor and bitterness. Taste is predominately citrus/tropical along with a grassy/spicy sensation throughout the second half. Flavor is akin to juice but without the sweetness. Malt base is nondescript pale malt; very subtle toasty flavor. It’s also highly quaffable and leaves no astringent or cloying aftertaste. If I had to go get a six-pack IPA right now, I’d buy this one. It seems like as soon as I set foot in Florida all I started hearing about was how great Funky Buddha is. I had tried a couple of their mainstays before (the IPA and hefeweizen), but I was never able to get my hands on a bomber of their more elite offerings until I moved to Orlando (and later, Lakeland) in 2016. 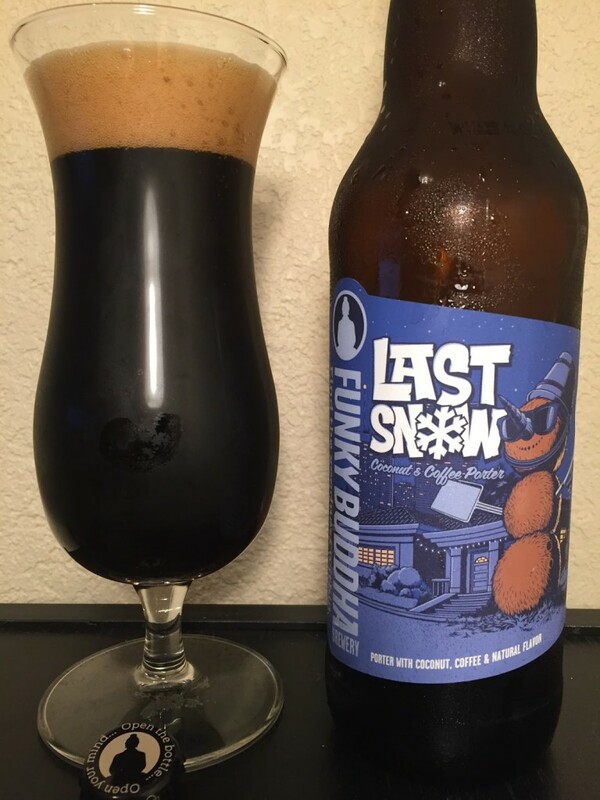 All the local beer nerds raved specifically about Last Snow – a strong porter (6.4% ABV) brewed with coffee and coconut. I’ve had some amazing flavored imperial stouts before (i.e. the entire Southern Tier Blackwater series), so I didn’t think this beer was going to do anything new for me. It tastes exactly as advertised: coffee and coconut. You wouldn’t think those two flavors would match, but they do quite well. It’s even more impressive considering the coconut tastes like real, authentic coconut – it’s not oily or sunblock-like (as is often the case with other beers made with coconut). Sweet, milky/creamy flavor up front (not chocolate). Dark malt but no roast or burnt flavor. Coconut flavor emerges at the apex followed by coffee. Faint cinnamon or other spice in the aftertaste. There’s a reason this beer sells out quickly and why bars and restaurants will hoard bottles for months and then build an event around breaking them out in the summer. Can’t wait for the 2017 edition!